Standard scales meet a broad range of needs for companies of all sizes. Whether it’s drum scales, bench scales or floor scales, there’s a good chance we have a model that will work well for your needs. On the opposite end of the spectrum, if you have a very specific need for a scale, a custom made scale may be a better fit for your unique needs. At Arlyn Scales, we’ve been a leader in the scale industry for more than 30 years. During this time, we’ve spent significant time and resources learning as much as possible about how a scale works as well as how to build the best possible scale at a price that is reasonable for our customers. We design and manufacture all of our scales in Long Island, NY. Our factory is uniquely located alongside our business offices allowing us to ship our scales factory direct to our customers as opposed to working with a distributor. This factory-direct approach allows us to pass on savings directly to our customers because of the fact that we do not utilize any intermediaries. This also allows us to reinvest some of these savings back into our manufacturing process to create even better scales for our customers. This factory direct approach and cost-conscious manufacturing allows our team to create a high quality scale that simply can’t be matched in the market. 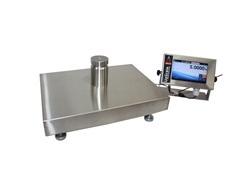 Whatever your weighing needs may be, Arlyn has a solution to meet them. With our custom-designed scales, we can include you in the design process to ensure that you end up with a scale that meets all of your requirements. There are a variety of reasons why you may need to purchase a custom scale including capacity, life span, accuracy, size and connectivity. You may need a scale with a higher capacity than you can find from a standard scale. For instance, lab scales usually require precise measurements, but have low capacities of 5 lbs. or less. At Arlyn, we’ve invented a weighing technology called Surface Acoustic Wave (SAW), which allows us to increase the capacity of our ultra precision scales without sacrificing accuracy. Our patented SAW load cells are able to measure displacement as opposed to standard load cells that measure stress. Because of this unique change in how our SAW load cells work, they can be manufactured out of thicker metal than standard strain gauge load cells. This allows our load cells to be able to provide much better accuracy at higher capacities. Capacities for our Ultra Precision Scales start at 10 lbs. and top out at 500 lbs. If you’re in need of an extremely high capacity scale, we also offer crane scales with capacities of up to 10,000 pounds and floor scales with a top capacity of 20,000 pounds. Contact our sales team if you need a scale with an even higher capacity. Arlyn Scales understands that our customers use our scales for a variety of different applications and therefore work hard to ensure all of our components including our SAW load cells and standard load cells. Many strain gauge cells use inferior aluminum, which is susceptible to shock loading (when a weight from a height is suddenly dropped onto a scale platform) and over loading (when a weight surpasses the scale’s capacity). This damage can lead to inaccurate readings and costly repairs or even replacement, which can cost you in terms of money and lost productivity. We utilize higher quality load cell materials to help minimize these common problems seen with standard strain gauge scales. When it comes to a scale’s frame, many manufacturers use sheet metal due to its low cost. At Arlyn, we use a welded construction consisting of steel, aluminum or stainless steel, based on the unique needs of our customers. This superior construction offers resistance from rust and corrosion. On top of a superior frame, we also manufacture our scale platforms out of stainless steel or aluminum for additional protection when exposed to harsh chemicals. If you’re in the market for one of our floor scales, we can also offer a zinc galvanized model or a triple epoxy featuring mica particles. These coatings offer additional protection from rust and corrosion. Whatever Arlyn scale you choose to purchase, you can rest assured it will provide you with precise measurements. Our larger scales use four stainless steel load cells in each scale to ensure the load cells’ output match eliminating the need for a summation board (one of the most easily damaged portions of a scale). With our SAW technology, accuracy is achievable even at extremely high capacities. If you’re working in the medical, chemical, pharmaceutical or any other type of scientific field, our Ultra Precision Scales should be your top choice. In today’s fast-paced world it’s not only important that your scale offer accurate measurements, but also that you can analyze those measurements through any number of different computer programs. With our scales, you can have access to a your scale by physically connecting to it through a variety of connectivity methods. You can even connect to it wirelessly from a remote location, via our WiFi and Ethernet options. Once connected to your scale, you’ll be able to monitor readings and extract weight data from your computer. Our scales offer a variety of output formats that are easily readable from popular computer programs like MS Excel or MS Access. While a scale may meet your needs, if it can’t fit into your workspace, it is of little use to you. We offer standard scales with platform sizes starting at 6” x 5.5”, all the way up to 7” x 9” x 4”. Should you need a customized scale platform outside of these measurements we’ll be happy to discuss a more custom solution. If you’re ready to learn more about how a custom-made scale can help to improve productivity and even save money in the workplace, don’t hesitate to contact Arlyn Scales today to discuss your needs. We can be reached by phone at 1-800-645-4301 or via our online contact form.